CHERNOBYL, Ukraine -- 1986: Design flaws, compounded by human errors, cause Soviet engineers to lose control of a reaction at the Chernobyl nuclear power plant. A partial meltdown occurs. Many die. Many more suffer. The final count of victims may not be over yet. 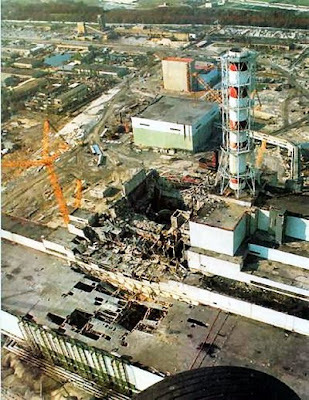 Aerial view shows damage to Reactor number 4 on April 26, 1986. Ironically the disaster that has become synonymous with the dangers of nuclear energy was caused in part by a safety test. The power-regulating system and emergency safety system of the fourth reactor at Chernobyl in Ukraine (then part of the old Soviet Union) were shut down for the test on April 25. Most of the control rods (the reactor components that stop nuclear fission from cascading out of control) were withdrawn from the nuclear core, while engineers allowed the reactor to operate at 7 percent power. The hydrogen mixed with oxygen and ignited, triggering a chemical explosion. This second explosion ripped the roof off of the reactor, exposing its radioactive core. Worse yet, it ejected an enormous amount of highly radioactive particulate and gaseous debris into the atmosphere — the majority of which drifted to Belarus (also part of the U.S.S.R. as Byelorussia). The effort to contain the resulting fire and cleanup is tragic and well-documented. Firefighters rushed to the scene to put out the blaze, many exposing themselves to deadly levels of radiation in the process. The fire was finally put out at 6:35 a.m. the following morning, but the exposed radioactive core remained. Soviet engineers scrambled to come up with a containment solution. Workers wearing heavy protective suits shoveled radioactive debris into what remained of the reactor. This cleanup crew could only be on the rooftops of surrounding buildings for a maximum of 40 seconds, because the radiation levels were so high. The cloud of radioactive debris spewed by the disaster drifted over Ukraine, Belarus and Russia. Consequently more than 300,000 people were evacuated from a roughly 18-mile zone that would later be dubbed the Zone of Alienation. Fifty thousand people were evacuated just from the town of Pripyat, turning it into an abandoned city virtually overnight. The death toll from the Chernobyl disaster is not well documented. Officially there were 56 fatalities, mostly from radiation poisoning after the event. However, a cover-up by Soviet authorities has spurred much speculation over what the long-term effects of the incident are. Outbreaks of cancers and birth defects have been blamed on the Chernobyl disaster but never scientifically substantiated. Because of power demand, the plant operated with its three remaining reactors for more than 14 years before being decommissioned in December 2000. The plant is scheduled to be dismantled and cleared away by the year 2065. Until that happens, one can take guided tours of the disaster site: Ukraine’s Ministry of Atomic Power started letting visitors in a few years ago.